You can buy any decks from us without worry now! Find out more! There are many tarot decks in the market. Which one particular deck is your destined deck ... the one and only deck meant for you and you alone? Kabbalah cards rely on the ancient wisdom of the Jewish mystical system based on the Tree of Life. The 33 beautifully illustrated cards can be used for guided meditation or readings to reveal underlying themes in life. 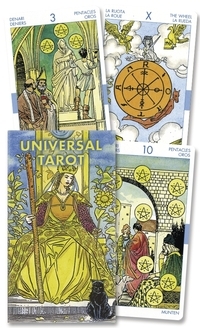 The 106-page illustrated booklet offers insights and clear guidance in interpreting the meaning of the cards. Fold out. Tree of Life diagram included. The cards were painted by Lady Frieda Harris according to instructions from the occult scholar, Aleister Crowley. The magnificent art deco work contains kabalistic and astrological attributions described in Aleister Crowley’s Book of Thoth. Aleister Crowley Thoth Tarot has been named one of the Top Ten Tarot Decks of All Time by Aeclectic Tarot. 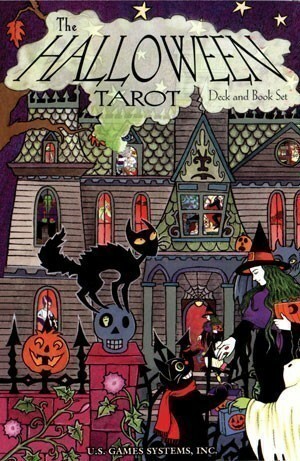 The most popular traditional tarot deck reproduced! One of the most waidely used deck in the World and used as the main reference deck by many books on tarot. 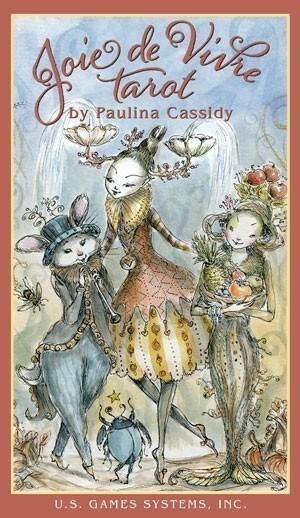 If you are new to tarot, this would be a great choice! This deck is filled with vibrant, richly colored images. The artwork in this deck is truly captivating. It will prove to be a brilliant working deck, that is quite capable of packing a punch! 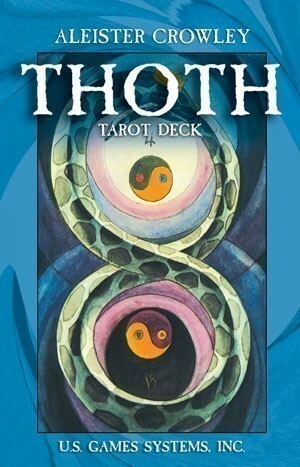 Drawn according to the instructions of the famous occultist Arthur E. Waite, artist Roberto De Angelis provides the student of Tarot with a useful working deck, appropriate for divination and study. 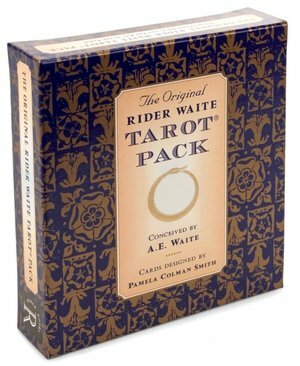 Containing all the elements of traditional Tarot arranged in new and interesting compositions, this deck is perfect for the serious apprentice as well as the seasoned reader. Readers will recognize familiar scenes while being delighted by De Angelis' uncluttered adaptations and sophisticated use of color. This deck is recommended for beginners. This beautiful deck is a rare mirage. The Gaian Tarot is an earth-honoring deck. It was created for pagans and others who honor Gaia, the earth, as a living being and who practice an earth-centered spirituality. Each card is enriched with colors and dimensions that appeals to the readers' personal spiritual being. The card communicates brilliantly the meaning and the hope of each arcana with details and ambience. Grab one now! The Tarot of the Dead depicts the serious issue of death in light-hearted manner. Tarot of the Dead explores death with wry humor and whimsy. Inspired by the Mexican Day of the Dead, a holiday honoring deceased friends and family, this deck seamlessly blends Mexican tradition with European divination. Engaging watercolor artwork-often depicting human and animal figures as skeletons-embraces the inevitability of our mortality. The Fool hitchhikes with his skeletal dog and The Hierophant sits in a lawn chair among pink flamingos. The fifty-six Minor Arcana feature pens, coffins, pistols, and film reels, an intriguing twist on the usual pips. The Tarot deck and the accompanying instruction booklet are in both English and Spanish. In this quietly powerful neoclassic deck, di Ferndinado Gumppenberg simplifies many of the cards without losing any of the symbolic intensity of the Tarot. The Marseilles style pips are clean and elegant. Hand-drawn borders complement the delicate line drawings and coloring. This unique deck with its gentle lines is a perfect expression of the poetry and magic worked by diviners everywhere, weaving the past into the present as they seek the future. Easy Tarot: Learn to Read the Cards Once and For All! 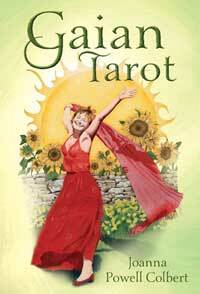 is a tarot kit with the Gilded Tarot and a different companion book by Josephine Ellershaw. Especially for beginners, including a quick guide to card meanings; sample readings, safeguards, and ethical guidelines; tips on keeping a Tarot diary; and troubleshooting advice for situations that readers come up against in a reading. This beautiful set includes 1 deck of Ciro's Gilded Tarot, 1 companion book and 1 Celtic spread giant poster. As the suit of the ancient element Earth, the Pumpkins describe all things that are physical and tangible, real and solid -- things you can taste and smell, and of course, count. The Ghost cards are haunted by the ancient element of Water, the symbol of the fluidity of the subconscious mind, dreams, instincts, and emotions. The Bats comprise the 'thinking suit,' reflecting a bat version of the intellect -- the uncannily sensitive 'radar' of these nocturnal creatures that helps them find food and avoid collisions even on the blackest of Halloween nights. Since the traditional Tarot suit of Wands is linked with the ancient element Fire, the devilish scarlet Imps make a delightful Halloween suit equivalent. 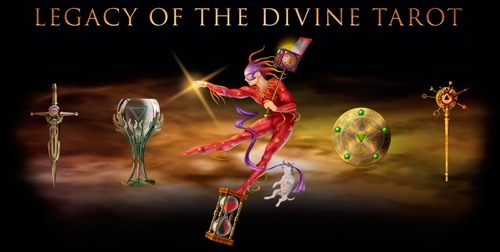 The Gilded Tarot is a digitally drawn and visually sumptous Rider-Waite style tarot from the talented Ciro Marchetti. This is not just a beautiful deck. It's both highly detailed and a well thought out reworking of the Rider format. I've no doubt it will become a classic and justifiably so. It should have a place in any serious collection. The set includes 1 deck of Gilded tarot deck and 1 companion book by Barbara Moore. 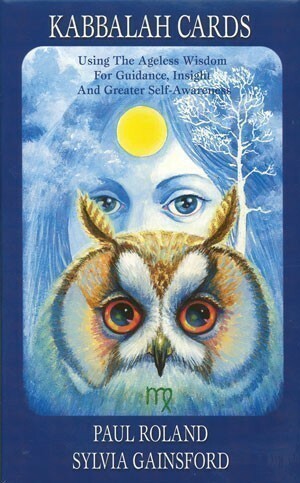 The Llewellyn Tarot is not a passive instrument, but a dynamic tool — a rainbow bridge between the inner and outer worlds empowering the user with the archetypal sources of wisdom needed to reveal and then meet the challenges of a purposeful life. Also included is The Llewellyn Tarot Companion, which features an introduction to the craft and history of tarot, along with Welsh legends infused in this deck. A restoration of one of the oldest tarots, the Visconti-Sforza cards. 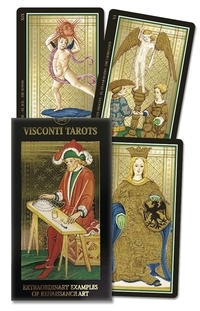 The symbolism is the same in this version, but the Visconti Tarot cards have clearer colours and there are metallic gold leaf highlights and backgrounds. (The gold doesn't show up well in scans, unfortunately. 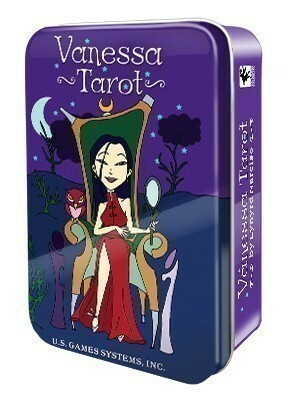 The Vanessa Tarot is a cute, sassy, and glamourous deck inspired by pop culture heroines. It's light-hearted, fun, feminine and still very readable deck for the girl in every grown woman (or man). Packaged with a small tin along with a booklet. 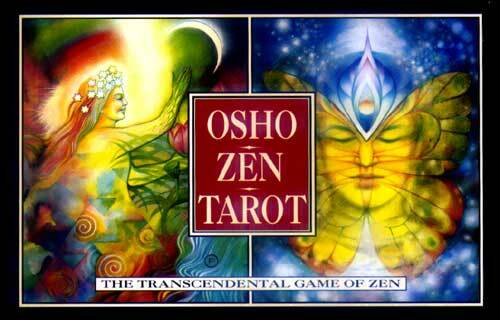 This OSHO Zen Tarot focuses on gaining an understanding of the here and now. It is a system based on the wisdom of Zen – a wisdom that says events in the outer world simply reflect our own thoughts and feelings, even though we ourselves might be unclear about what those thoughts and feelings are. 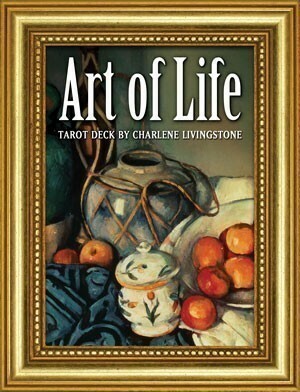 The Art of Life Tarot matches well-known paintings - from Van Gogh, Mucha, Degas, Klimt and more - with inspirational quotes. Each card features a well-known work of art paired with an insightful quotation. The cards in this unique deck may be used for traditional tarot readings or individually for daily inspiration. All these sets are imported from US or UK. You will most likely never find it anywhere else in Malaysia. All listed decks are new sets unless explicitly stated in the catalogue. Beware of clone tarot decks that have fader color and thinner cards. These fake decks may cost cheaper but would most certainly last much shorter than the original, true copy. These beautiful decks of cards stimulate creativity and communication! A colourful springboard lending wings to imagination, they are a cross between game and book. They are both a tool and a game at the same time for adults and children of all ages. OH cards are also suitable for a wide spectrum of use, from family play to team training in industry. Fun for all and everyone wins! Each individual deck can be used on its own or in conjunction with any (or all) of the others, like building blocks for creativity. Unlimited variations are possible. Easy-to-follow instructions for play and work are included with every deck. This series is now available around the world in 21 different languages. 88 picture cards painted by naturalist Christian Gronau depict a broad span of Earth´s natural environments. Some seem documentary, others almost mythical, some serious, others funny. HABITAT (Latin for “he, she, it resides”) invites us to playfully find connections and networks within our surroundings. The cards don´t give answers, they stimulate questions about the interconnectedness of all things. A large velvet cloth for a more professional reading session. This well crafted pouch will give life to your reading even before the deck is shown! All products will be delivered to you via POSLAJU/POS EXPRESS upon confirmation of the payment. Look for original quality decks for your intuitive needs, you will never regret the value you pay for here. Product list is updated every month, do come back! Get enlightened! Your lucky day has just began! for iBooks and most eBook readers. We are supporter of the Ho'oponopono! .I am sorry. Please forgive me. Thank you. I love you. I am a gratitude ambassador!